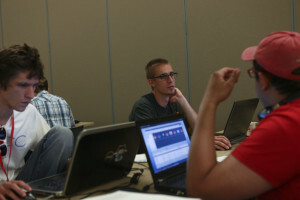 CEDAR CITY — The U.S. Cyber Challenge has announced the winners of the 2015 Western Regional Cyber Camp competition, hosted by Southern Utah University. Following a week of demanding classroom instruction, over 40 participants competed in the “Capture the Flag” competition July 31. 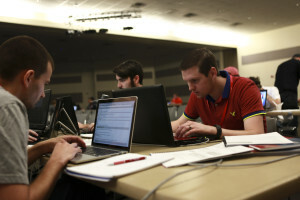 Capture the Flag is an interactive college final in which teams are tested on skills needed by information security professionals. The winners included Norman Lumdt, Eric Harashevsky and Nick Landers. “On Friday, I observed a talented group of individuals participating in a challenging competition to demonstrate how capable they are at defending our nation against cyber threats,” Leon Trappett said. Trappett previously participated in the Western Regional Camp and is now employed as head of IT security by the Bank of Utah, one of the event’s sponsoring companies. “The U.S. Cyber Challenge is identifying and equipping our nation’s future cybersecurity leaders,” Trappett said. The awards ceremony that followed the competition included remarks from Rob Robertson, SUU Computer Science and Information Systems department chair; Karen S. Evans, U.S. Cyber Challenge national director; Doug Logan, CEO of Cyber Ninjas; Scott Moffitt, Utah Department of Technology Services Rural Support manager; Tab Pierce, president of Caliber Security Partners; Rudy Pamintuan, managing director for Sherman Consulting Inc. The camp included classes on identifying and reverse engineering malware, testing web applications for vulnerabilities, understanding critical infrastructure and protecting energy, oil and gas sectors through identifying and securing radio frequencies. Participants of the camp were selected and invited based in part on their scores from Cyber Quests, an online qualifying competition held in April 2015. Nearly 2,000 individuals competed in the 2015 Cyber Quests. Each U.S. Cyber Challenge camp has the mission to increase the quantity and quality of our country’s cybersecurity workforce. The U.S. is faced with a severe shortage among highly skilled cybersecurity professionals to fulfill both public and private institution needs. Cyber camp programs can identify and train top talent, and are crucial to filling the workforce gap. Camp participants can continue their career networking and skills development through the newly launched CyberCompEx.org — an online social networking site designed specifically for the cybersecurity community. U.S. Cyber Challenge is a program of the Center for Internet Security, a 501(c)3 organization. Its mission is to significantly reduce the shortage in the cyber workforce by identifying, attracting, recruiting and placing the next generation of cybersecurity professionals. USCC’s goal is to find 10,000 of America’s best and brightest to fill the ranks of cybersecurity professionals.